A perception of the National Championship Game is that Ohio State pummeled Oregon badly on the ground, and in particular two plays hurt the Ducks the most. 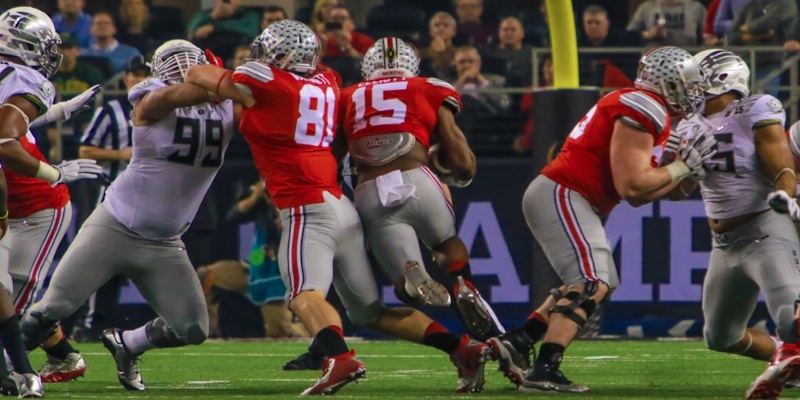 We will look at the first of the two of the major Buckeye running plays today, although we also know that the OSU QB played incredibly well against Oregon (especially on third down) and was a major factor in the Ohio State victory. No dispute from FishDuck on that point, as it is a component that we all clearly saw and that needs no further examination. Skull Sessions with Grizzled Ol’ Coach really chew me up. The Grizzled Ol’ Coach, (Mike Morris) and I sat down for a couple of Skull sessions to break down these two plays, even though I usually do not study the opposing team’s success against my beloved Ducks. There have been so many erroneous or misguided statements made by Duck fans, thus it provides too good an opportunity to pass up for others and me to learn about defensive assignments. We have not covered this before, so let’s enjoy learning something new! Coach Morris explained that you rarely see a true “Trap” play in college football because of the sophistication of defenses now being able to stop it. Teams that run the Spread Offense have created a variation called the “Wham” and was made famous by Urban Meyer when he was at Florida winning NCs with Tim Tebow. They would have an H-Back or TE block the nose tackle, and the center would go block the middle linebacker, and thus Tebow would power like a freight train right up the middle. Coach Meyer created an offshoot of this at Ohio State, only with running their star RB ‘Zeke Elliott as the ball carrier, not the QB. 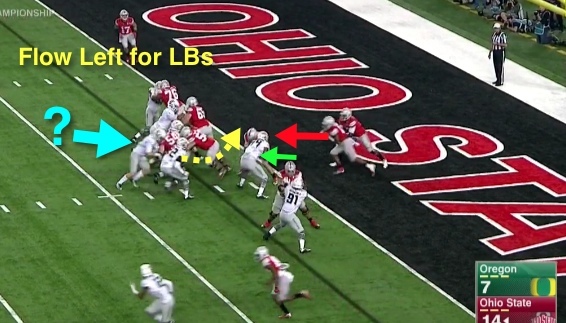 Watch the H-Back (Red lines) of Ohio State. This “Wham/Trap” play is what the Buckeyes hurt Oregon with in the first half. Note the H-back in motion (above) and how he is going to block on the first one past the “O” gap, which is head-up on the center. To best understand what we mean with defensive assignments, it is best to consider the “gap control” duties given to each player in the front seven of the Duck defense. To learn more about Offensive “gaps” and defensive “techniques” you will want to refer to this short article of explanation or look at the simple chart above. The gaps are the spaces between offensive linemen, and the numbered “techniques” are the positions the defensive line would align at. “Flow” is to Oregon’s left. The red dotted line (above) indicates an important concept to learn about linebackers, and that is the playside “flow” side of which is going to the left side of the Oregon defense. In the Ducks’ gap control scheme, Tui Talia takes the “B” gap (No.55) and he is doing an excellent job standing up his man and is ready to defend the “B” gap. Note how Joe Walker (No. 35) is going to be coming around to take the “C” gap on the left side of the Duck defense (curved yellow arrow above). The issue on this play is the straight upper yellow line above, as that linebacker needs to come up and take on the inside shoulder of the offensive guard coming out to block him. If this linebacker makes this play, the gap is plugged with the two of them occupying it. 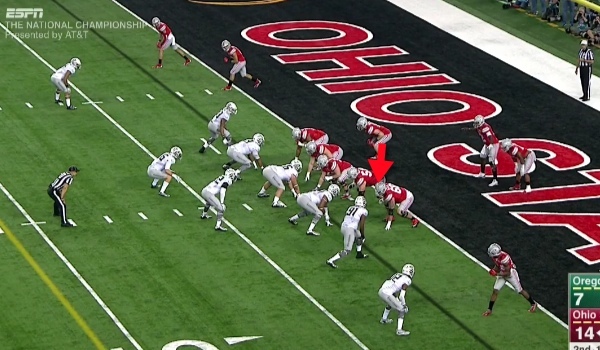 The Buckeye running back can see that Oregon’s “C” gap on the Duck left side will be filled by No. 35, Joe Walker (above) while No. 55, Tui Talia, is in an excellent position to discard his blocker and make the tackle at the line of scrimmage. The problem is the Oregon linebacker indicated above by the light blue arrow; he decided to try to evade the Buckeye blocker by looping around to his right — and he effectively took himself away from the gap and created a running lane for the tremendous runner of Ohio State, ‘Zeke Elliott. It is the only open gap and Elliott sees it and accelerates through it. This screenshot above shows it all, as we see from the yellow arrow that Joe Walker is ready to explode into his “C” gap to plug the play, while Tui Talia to the left has done an incredible job beating the block and ready to plug the “B” gap. 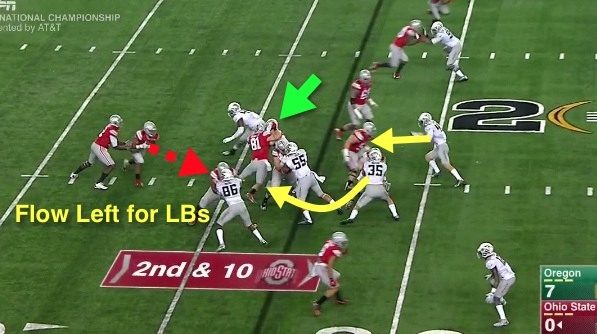 The green arrow shows the Ohio State H-Back blocking the Oregon nose tackle, (Sam Kamp) yet Kamp is positioned to plug the “A” gap. To the left of the Buckeye QB, (No. 12) is DeForest Buckner (you can see one “4” of his No. 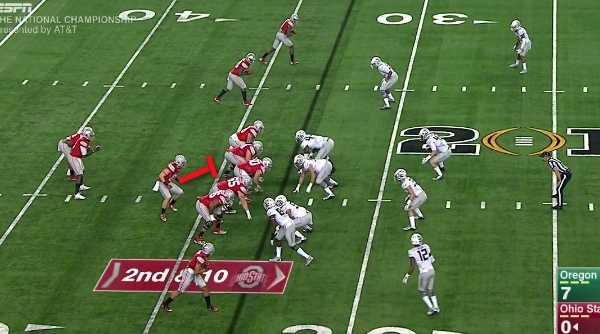 44) and Buckner’s presence prevents any cut-back by the Ohio State RB, No. 15. The only gap open is right in front of Elliott and he is charging through it. Where is the Oregon defender for that gap? 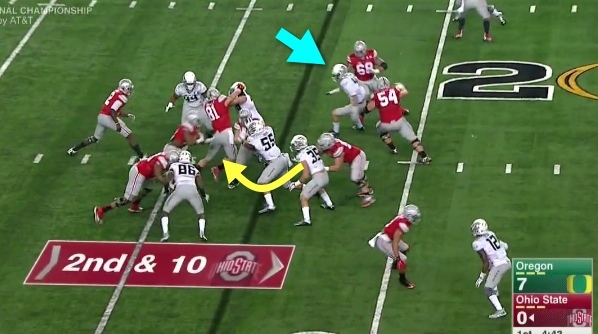 He is the linebacker who looped around (light blue arrow above) and opened up the gap for the Buckeye RB. Elliott breaks into the secondary and runs for a touchdown in the first half of the National Championship (above). Everyone on the Oregon defense did his job, with the exception of the backside flow linebacker — who took a bad angle. It is easy for us to judge, but the linebacker for the Ducks was giving up 80 pounds to the blocker coming at him, and who also had two steps head-of-steam coming toward the Oregon linebacker. This linebacker is a freshman who was in the game to give the starter a breather, and thus has some discipline-with-technique issues to learn. If he crashed forward into that inside shoulder of the offensive guard — there is no gap, and no touchdown. It is that simple. In the second quarter the Ducks came six inches short of scoring a touchdown and Ohio State took over on downs. On second down we see (red arrow above) that the Buckeye H-back is going to Wham-Trap again, only this time he will be trapping DeForest Buckner. First note the flow of the play is going to left of the Oregon defense, which would make this the playside for the Oregon defense. We see DeForest Buckner (green arrow above) doing a great job of standing up the blocker and plugging that gap. To his left is Derrick Malone (No. 22 and yellow dotted arrow) who is charging into the backside flow linebacker gap beautifully and filling that for the Oregon defense. The freshman linebacker (light blue arrow) has mis-read the flow side and is thinking he needs to plug the backside gap, thus is not in the position that Joe Walker was in the last play to fill the playside “C” gap. Again… everyone has his gap filled in the Oregon defense except for the playside “C” gap, and the linebacker responsible (light blue dotted arrow) is far out of position to make a play. The superb Ohio State RB (‘Zeke Elliott, No. 15) is headed right to the open hole in the Duck defense. The screenshot above is almost a thing of beauty; Buckner (black arrow above) has stood his man up, and Malone (yellow arrow) has filled his backside gap wonderfully. 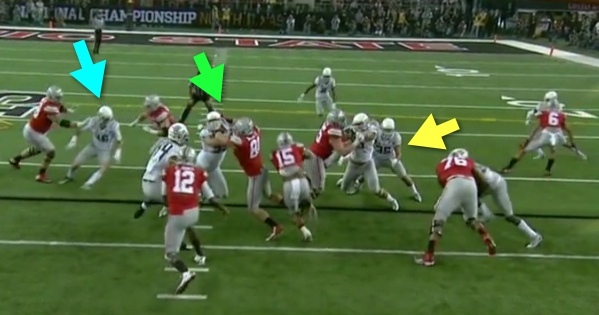 The double green arrows are Balducci and Armstead filling the “A” and “B” gaps perfectly and the “C” gap is wide open from the Oregon linebacker who mis-read the flow side (light blue dotted arrow above). Defended well, but for one gap! OSU RB Elliott busts into the clear for a 27 yard run that could have been stopped for a short gain. A couple of items to finish with, and the first would be to give the Buckeyes all the credit due as they had made the blocks and their running back had the vision to find the open hole in split seconds. The second is to not call out the player who made the mistakes; he is a freshman learning and will become a great linebacker for Oregon in the near future. Remember that Kiko Alonso did not have the light come on until nearly half the way through his junior year. 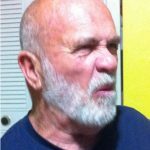 It takes awhile to learn your technique and to recognize and follow your keys, and thus mistakes such as a bad angle or flow recognition are going to happen with newbie players. Why didn’t we have more experienced linebackers stepping in? We had injuries and discipline issues at the position — thus the next man up is a promising freshman who made a ton of great plays for Oregon through the season. He will be better! Rarely have we ever pointed out the great play of our opponent or disclosed Oregon errors — but this was a tremendous opportunity to learn more about recognizing “flow” and understanding gap discipline by the Oregon defense. Of course none of this happens without the Grizzled Ol’ Coach being patient with me as we howl at the screen during his technique lessons. What a joy and a privilege it is for me!